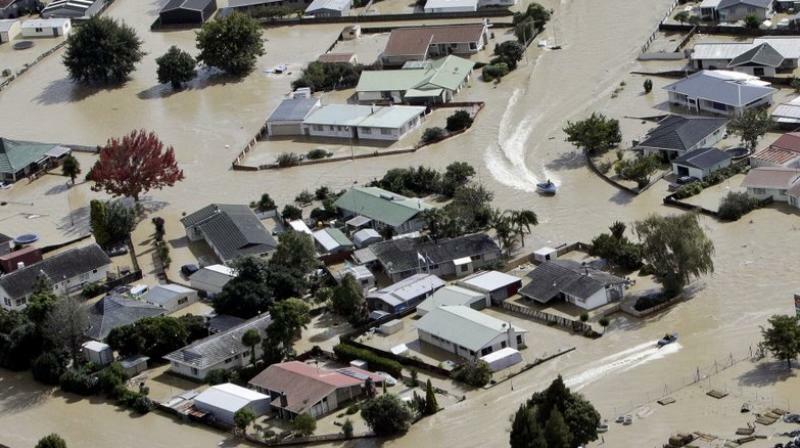 Wellington: People used jet boats and tractors to help rescue about 2,000 residents of a New Zealand town after a river burst through a concrete levee Thursday, flooding hundreds of homes and businesses. Local authorities declared a state of emergency after the levee failed in the town of Edgecumbe on the North Island. New Zealand has been drenched in recent days by the remnants of Cyclone Debbie, which flooded parts of Australia's east coast last week. Tony Bonne, the mayor of the Whakatane District Council, said the water was more than 1 meter (3.3 feet) deep in some homes and that one nearby river had reached an all-time record height. He said some leaking had occurred around the concrete levee on the Rangitaiki River before it failed. He said crews had worked to reinforce the structure and thought they had it secured when "she just let go." "Some people are in shock, of course, but many are accepting that this is something that's a part of nature which they have no control over," Bonne said. "Most people in these small towns rally around each other and Edgecumbe is no different." Andy Best, a meteorologist with MetService, said a nearby weather monitoring station had recorded 191 millimeters (7.5 inches) of rain over the last couple of days, an amount that would typically fall over two months. He said the worst of the weather system had passed and the forecast was for improved weather in the coming days. The rains also affected the town of Kaikoura, where access roads were closed due to mudslides. Access to the town has been reduced since a powerful earthquake last November brought down hillsides and closed the main northbound route. Bonne said questions would come about how the water flow was managed from hydroelectric dams upstream on the Rangitaiki River before the levee failed. Local Government Minister Anne Tolley said she understood that the operators of the dams had released some water over the past few days in anticipation of the high rainfall, but she didn't have the technical expertise to know if they had done enough. She said authorities have set up two welfare centers where people from Edgecumbe can stay, and she didn't know when they would be able to return to their homes. "The message is, it's not safe, your life could be at risk, don't go home," she said. "And that's really hard."